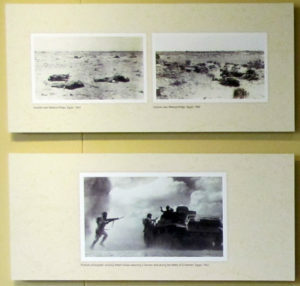 To coincide with Anzac Day we present memorabilia and paintings of a soldier’s time in North Africa during World War II. 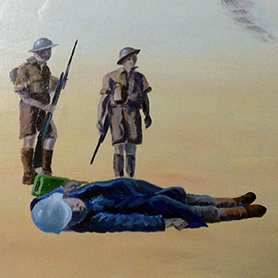 Inspired by the small black and white photographs from his father’s war albums Maurice Betts has created these paintings, exploring life in the field. Maurice Betts has painted for over 35 years, often during holidays, while working full time and with the usual commitments of family and home. It wasn’t until 2013 that Maurice retired from his professional career to pursue his love of art. 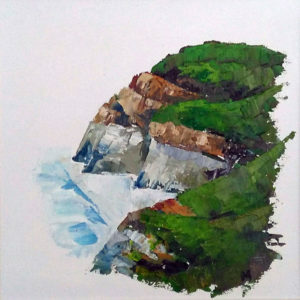 His work has reached private homes in various parts of the country and he has exhibited in galleries including New Plymouth’s Kina Gallery, Real Tart, the NZ Art Show in Wellington and the Mandarin Tree Gallery in Gordonton on the outskirts of Hamilton. Commissions include works for art auctions and specific scenes, works in oils, water colours and subject sketches. This exhibition, Someone’s Son – from my father’s albums is a tribute to Maurice Betts’ father, the late Stan Betts, MBE, who served in North Africa during WW II. The enlarged images are from Stan’s albums, small black and white photos he either took himself or collected. Maurice’s paintings are representative of these scenes. The narratives are also from Stan’s diaries in which he recorded daily events of the war and of the men he served with, many bearing familiar Taranaki family names. Maurice Betts can be contacted through his Facebook page Art in Ballance or on his mobile: 0276 777 880.